Nikola Motor Co. will go head-to-head with Tesla in the battery-electric heavy truck market by offering battery-dependent versions of its hydrogen fuel-cell day-cab trucks. 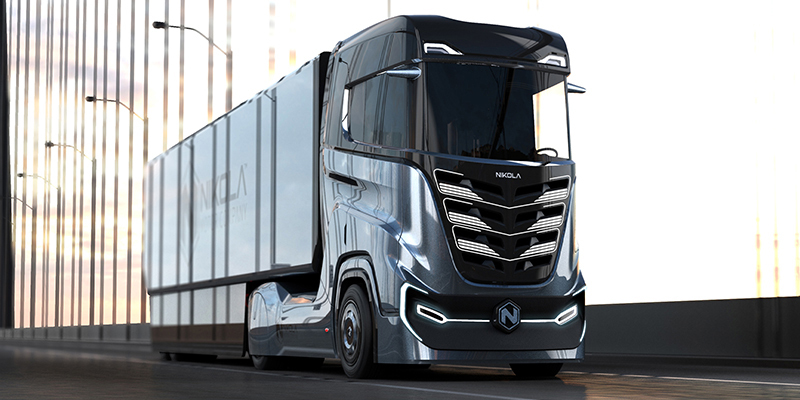 “They are both electric trucks; it’s just a matter of how the electricity is stored,” Nikola founder and Chief Executive Trevor Milton told Trucks.com. Battery-electric versions will use the same chassis and cab as the fuel-cell electric trucks, Milton said. They will be offered as an option on the Nikola Two, designed for North America, and the Nikola Tre, designed for Europe. Milton said some customers have asked about battery-electric versions for some short-haul applications. “It’s a smart tactical move,” said Antti Lindstrom, trucking analyst with IHS Markit. “It will make their products more competitive for regional and local delivery markets, where weight is not as much of an issue,” he said. The decision to add a battery option wasn’t difficult or costly, because Nikola’s trucks are still in the testing phase, and limited commercial production won’t begin until 2022, Milton said. Nikola’s plan is to start fleet testing with 25 trucks next year. That will grow to 100 in 2021. It plans to launch limited commercial production in 2022 and full production in 2023. The vehicles will be built near Phoenix at a yet-to-be-constructed new plant in Coolidge, Ariz. The only details so far have been issued via Nikola’s Twitter account. A brief message said that a one megawatt battery pack would weigh 23,100 pounds and deliver about 400 miles of range in optimum conditions, 300 miles in cold weather. That’s in a tractor-trailer rig with 80,000 pounds combined weight. Nikola said it also would offer 500 kilowatt-hour and 750 kWh battery pack options for shorter distances. With a full megawatt battery pack, a Nikola tractor would weigh 20,000 pounds. That battery pack apparently would be assembled from 69,000 cylindrical “21700” cells, according to the message. That’s the same type of cell used by Tesla in its Model 3. The previously announced Tesla Semi is expected to use a larger, “industrial” cell in its packs. The Tesla truck, announced at the end of 2017, is due to begin limited production around the end of this year, according to the latest statement from Elon Musk, Tesla’s chief executive. Tesla’s truck is aimed at the same regional, short-haul market at which Nikola is aiming its battery-electric model. It may all hinge on which company hits the market first. Well-publicized production bottlenecks with Tesla’s Model 3 electric car don’t bode well for a quick launch of the electric truck despite the previously announced “late 2019” start date, Lindstrom said. In the past, Milton has shrugged off suggestions that his company would compete with Tesla, saying that the two were in completely different markets because their trucks used different energy sources. That’s still largely the case, because hydrogen remains Nikola’s primary focus, Milton said. He said the company has more than $14 billion in preorders for its fuel cell trucks and expects them to account for more than 95 percent of Nikola’s business. The fuel-cell trucks are aimed at the long-haul market and will provide up to 1,200 miles of range on a tank of compressed hydrogen, he said. Toyota also is developing its own hydrogen fuel cell heavy truck, but is aiming it at the short-haul market. Fuel-cell systems use hydrogen as an energy carrier and produce electricity for the drive motor by passing hydrogen through a catalyst. They have very small storage batteries, typically under 10 kWh, versus the huge battery packs used in a battery-electric truck. The hydrogen fuel-cell trucks are about 5,000 pounds lighter than the battery-electric models and will offer lower operating costs over the standard million-mile lease, Milton said. Nikola is planning a network of hydrogen stations in North America and Europe to serve its trucks and other hydrogen fuel-cell vehicles. The company is planning to display its truck models and a model of its hydrogen station at an upcoming event, Nikola World, near its Phoenix headquarters in April.